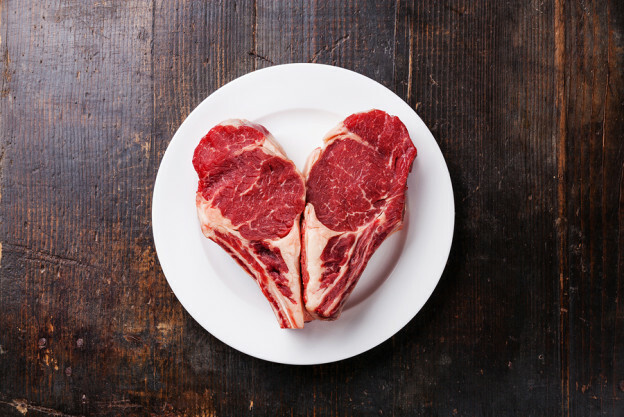 Red meat that’s good for your heart? Unless you’re a vegan or vegetarian, I’ll bet you enjoy sitting down to eat a nice beef tenderloin, prime rib or rack of lamb every now and then. While I’ve been limiting my intake of meat to around 10% of the plate every two or three days, I still enjoy it when I do. My absolute favorite is grass-fed New Zealand lamb. But I’ve also developed a taste for prairie-raised bison – buffalo meat – in the past few years. It has a similar flavor to beef, but I find it to be a little bit richer… maybe even a little sweeter. However, it’s not just the taste that makes bison a home run in my book. It also comes with a nutritional profile that exceeds most other animal proteins available to you. You see, unlike today’s cattle, free roaming buffalo are much closer to the wild buffalo and other meat sources available to our ancestors. And even though buffalo themselves are huge, they’re actually much leaner than cattle. So the meat doesn’t contain nearly as much fat. Well, imagine sitting down to a juicy three and a half ounce burger. You have a choice between grass fed beef or grass fed bison. If you choose the beef, you’ll get more than five times the amount of saturated fat than you would get from the bison. 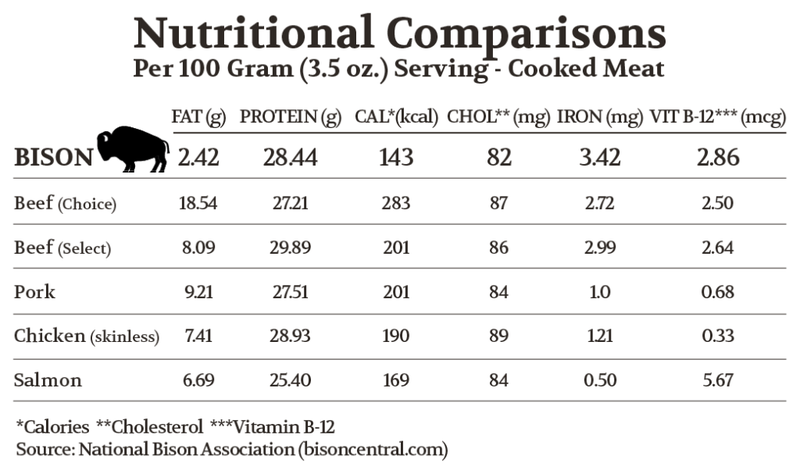 The difference is less than a gram of saturated fat in the bison, while the beef will have about five grams of it. Now, I’m not saying you shouldn’t eat grass fed beef. It’s a good choice… when eaten in moderation and a much better choice over factory raised beef being fed GMO corn and which may also have loads of antibiotics and hormones added. But if beef is a mainstay in your diet, this difference in fatty content could make a world of difference to your health. Especially if you’re still eating commercial beef. You see, eating beef on a regular basis interferes with your arterial function. It also raises your levels of two inflammatory markers; C-reactive protein (CRP) and interleukin-6 (IL-6). These proteins are bad news. They’re linked to heart disease, cancer, Alzheimer’s and other inflammatory diseases. But what happens when you regularly eat bison instead of beef? No increase in arterial problems. No rise in inflammatory markers. No increased risk of heart disease or clogged arteries. In other words, it’s an even healthier red meat. If you haven’t tried grass fed bison yet, I recommend it. Down here in South Florida, I can pick it up at my local Whole Foods store. Even Publix carries it. But if you live off the beaten path, you might not be able to find it unless you order online. To help you out, I talked to the folks at Wild Idea Buffalo Company. I don’t have any affiliation with them, but wanted to check them out. These folks raise 100% grass fed buffalo on the wide-open prairies of South Dakota. And all of the animals are antibiotic, hormone and grain free. Once you place your order, they’ll pack it up in an insulated cooler with dry ice and frozen gel packs. They’ll also send you an email with the expected delivery date. But I do have one warning: The delivery isn’t always quick. Now, one last thing. You can’t treat your bison the way you would beef. It’s a very lean meat, so it cooks quickly. It requires about one third less heat during cooking – and cooks in about one third less time. The more delicate cuts (ribeye, filet mignon, etc) are great broiled or grilled. When broiling, lower the oven rack a little further than you would for beef. For grilling, let the coals die down a bit before cooking. It only takes about five to eight minutes on each side (depending on thickness) to reach medium rare. Roasts, briskets and short ribs require a longer cooking time at even lower heat. I’m sure if you get creative, you can find all sorts of interesting cooking tips and recipes on the internet. And remember! Keep your meat consumption – including bison – to only about 13% or less of your diet. Fill the rest with fresh vegetables, fruits, beans and nuts. National Nutrient Database for Standard Reference Release 28. United States Department of Agriculture. Last accessed Dec 2015. Santos S, et al. Saturated fatty acids intake in relation to C-reactive protein, adiponectin, and leptin: a population-based study. Nutrition. 2013 Jun;29(6):892-7. McDaniel J, et al. Bison meat has a lower atherogenic risk than beef in healthy men. Nutr Res. 2013 Apr;33(4):293-302. Are You Cooking Your Way to Cancer? You CAN have your steak – and eat it, too! This entry was posted in Heart Health and tagged bison, grassfed beef, heart health, meat and heart health, red meat on January 15, 2016 by wellness. Bison tastes better than beef anyway.